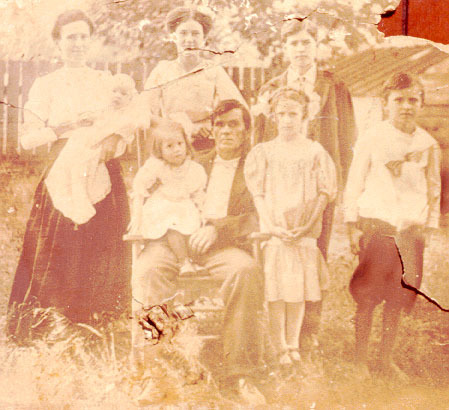 Back Row, L to R: Zilla Barron Culpepper holding Charles E. , and Mary A. Eliza; Front Row, L to R: Adella Zilla in lap of William A., Sarah Elizabeth, and James Francis. This photo was sent to Lew Griffin in 1980 by Manola Culpepper Logan (Mrs. Thomas G. Logan) of Detroit, MI. She was a descendant of Elias Daniel Culpepper, and suggested that this photo was of his family. However, if one looks at the children, and their ages and sexes, this cannot possibly be the Elias Daniel Culpepper family. But the photo is a perfect match for the family of Elias D.'s brother, William A. Culpepper. So I'm posting the photo here. Further information on this photo will be appreciated. daughter of W A CULPEPPER. Biography* � Mary A. Eliza was the daughter of William Araspes and Zillah Ann Caroline (Barron) Culpepper. She was born and raised in the vicinity of what is now Wadley, AL and she was noted with her parents in the 1870 census of Randolph Co., AL. Anniston Calhoun County Public Library, Randolph County, Alabama Birth Register 1886-1895, Anniston, AL: Annie Calhoun Book Shop, 1989. John William was supposed to have played the trumpet and would climb a big tree in front of the house and play early in the morning waking up the neighbors. I knew him and his wife well, they were devout Christian people, and were loved and honored by all who knew them. Biography* � James F. G. Culpepper was the son of William Araspes and Zillah Ann Caroline (Barron) Culpepper. His middle names are a puzzle. A granddaughter, Mrs. Arthur (Marie Veazey) Turk wrote 5 that he was named James Francis Culpepper but "he objected to Francis and used Franklin instead." In the 1870 census he was noted as "James G. Culpepper." One wonders if his full name might have been James Francis Gillespie Culpepper? In any event, he was born and raised in the vicinity of what is now Wadley, AL and he was noted with his parents in the 1870 and 1880 census records of Randolph Co., AL. In 1887, James married Valula Ann Seymore. Unfortunately, the 1890 census records burned so it is not known where the couple settled down initially. They are noted with their young family in the 1900 census of Chambers Co., AL and they are found in the 1910 census in Randolph Co., AL. James F. Culpepper's wife of 22 years died in 1910. He was 43 years old. In 1911, he was married a second time, this time to Lela Lenora "Nora" Stephens. Nora (Stephens) Culpepper appears in the 1920 census of Tift Co., GA, as a widow living with her brother Walter and daughter, Maude. James is presumed to have been named for his ancestor Francis Gillespie. The family must have been proud of Francis Gillespie, as his name was commemorated in more than one branch of the family. Obituary for Hoyt Culpepper (Sr.) published 28 Nov 1949 in the Chronicle Telegram (Elyria, Ohio). James Francis Culpepper died 13 Nov 1950 in San Patricio Co., TX. E-mail written Mar 2006 - Oct 2007 to Warren Culpepper from Frederick Seymour Culpepper (#22390), 330 Hialeah Dr., Corpus Christi, Texas 78418, e-mail address. Walter Stephens, Brother, M, 34, Sng, AL/AL/AL, Farmer. Biography* � Charles E. Culpepper was the son of William Araspes and Zillah Ann Caroline (Barron) Culpepper. He was born and raised in the vicinity of what is now known as Wadley, AL. He was noted with his parents in 1880 Randolph Co., AL census records. Sometime in the 1890's, Charles went with his parents to Hopkins Co., TX 7 but the family returned to Alabama before the 1900 census. "Mr. Charlie Culpepper and Miss Lula Stewart" married "last Sunday" (12 Dec 1897) in "Flat Rocks (Almond)". Biography* � William Seymour Culpepper was the son of James F. G. and Valula Ann (Seymore) Culpepper. He was born and raised in Alabama, possibly in Chambers Co., AL since this is where he was noted with his parents in the 1900 census. By 1910, the family had moved to Randolph Co., AL and this is where his mother died when William was 12 years old. William's father and stepmother have not been located in 1920 census records but, based on later records, it is possible that the family moved to Georgia. In 1920, William appears as a 22-year-old single man and boarder at Dahlgren, Naval Proving Grounds, King George County, VA. His occupation was a surveyor of roads. E-mail written April 2004 to Warren Culpepper from Nathaniel Frederick Culpepper, e-mail address. William S. Culpepper, Boarder, M, Wh, 22, S, AL/AL/AL, Surveyor-Roads. Obituary of James Robert Culpepper, published 4 Apr 2007. John Culpepper, Son, 1 11/12, IL/AL/IL. Obituary* 23 Nov 1949� AVON LAKE. Services were held Friday for Hoyt Culpepper, 44, of Herman Drive, who died suddenly Tuesday of a heart attack at his home. For the last 15 years he had represented the George Weston Biscuit Co. of Battle Creek, Michigan. He had been active for many years in the Associated Grocery Manufacturer's Representatives. He was a member of the Avon Lake Boat Club. Survivors are his wife, Margaret; a son, Hoyt, Jr., of Chicago; and a daughter, Mrs. Marilyn Tomkinson also of Chicago, Illinois. Gertrude D. Culpepper, Daughter, 21, md @ 17, IL/GER/GER, Typist in Adv Co.
Mareline A. Culpepper, Granddaughter, 2 3/12, IL/GA/IL.